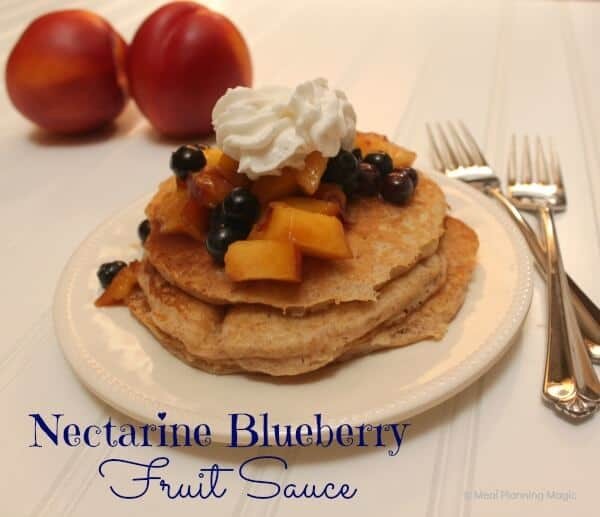 Nectarine-blueberry sauce is a delicious fresh fruit condiment that is so easy to make! 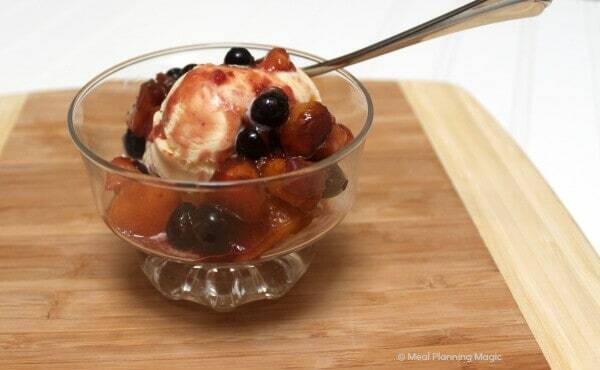 This homemade fruit sauce recipe is made with fresh blueberries and nectarines. It’s the perfect topping for breakfast foods like pancakes and waffles, or over a scoop of ice cream for dessert. Summer is just flying by for us! 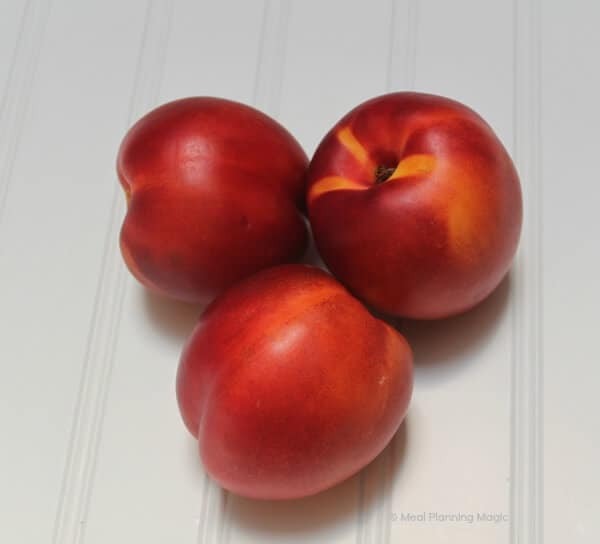 So I thought it only fitting I choose a summer fruit to highlight for this month’s Eating the Alphabet series, featuring foods that start with the letter M, N or O. I chose nectarines since they are in season right now and they have been SO good. I paired this favorite fruit with another, blueberries, to make a delicious fresh fruit sauce that is a delicious alternative to syrup on pancakes, ice cream or even as a filling in crepes. Actually, the ideas are limitless! And thanks to the nectarine’s natural sweetness, just a teaspoon of sugar is all I added to make this sauce. We love to serve nectarine-blueberry sauce over this favorite recipe for whole wheat pancakes, from AllRecipes. I love that the sauce offers a lower added sugar option than syrup. We sometimes squirt a bit of real whipped cream on top (gram for gram, still lower in sugar than the stuff you buy in the syrup aisle, as most of it is high fructose corn syrup with coloring added!). We also like the fruit sauce on top of vanilla ice cream or added with vanilla yogurt into a sweet crepe good for breakfast or a healthy dessert. 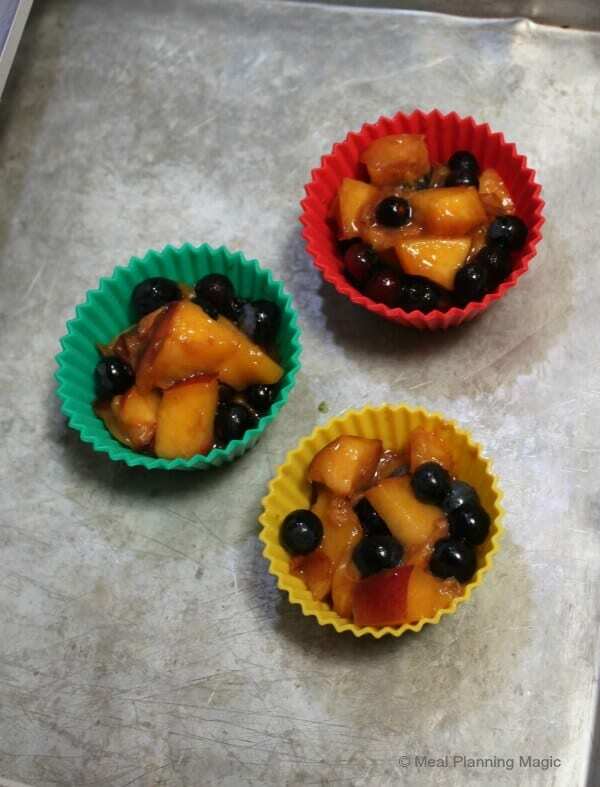 If you have extra fruit sauce, you can freeze it in silicone muffin cups for individual portions. When you’re ready to use, just thaw the mixture and serve. You can taste summer all year long that way! Nectarines are low in calories and have a number of health promoting anti-oxidants, minerals and vitamins like Vitamin C, potassium, B-complex vitamins and more. I hope you’ll give this simple nectarine-blueberry sauce recipe a try! 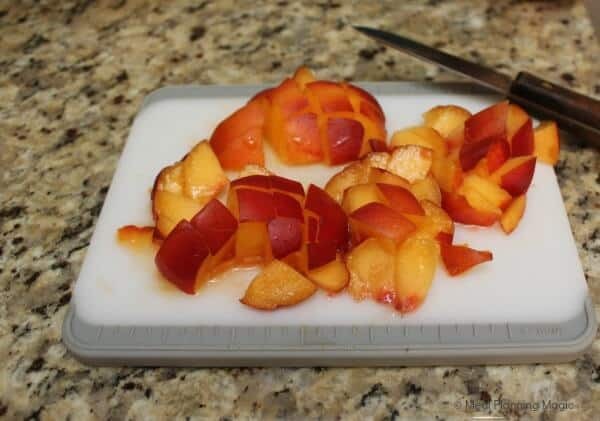 Chop nectarines into about 1/2-inch or smaller chunks. Peeling is optional (I don’t peel the nectarine—we don’t mind it!). 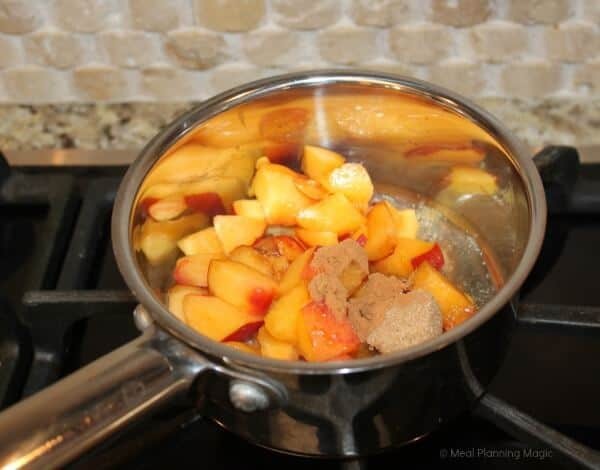 In a small saucepan, add water, cinnamon, brown sugar and nectarines. Stir to combine. Over medium heat, bring mixture to a boil, stirring often so as to avoid burning. Simmer for about 5 minutes then stir in blueberries until combined. Heat for about 5 more minutes, until berries are warmed through. Remove from heat and serve over pancakes, ice cream, in crepes or whatever! Dice the nectarines into bite-size chunks. Add the nectarines along with cinnamon, sugar and water and bring to a boil to start the sauce making! You can freeze extra sauce in silicone muffin cups to thaw and use later! 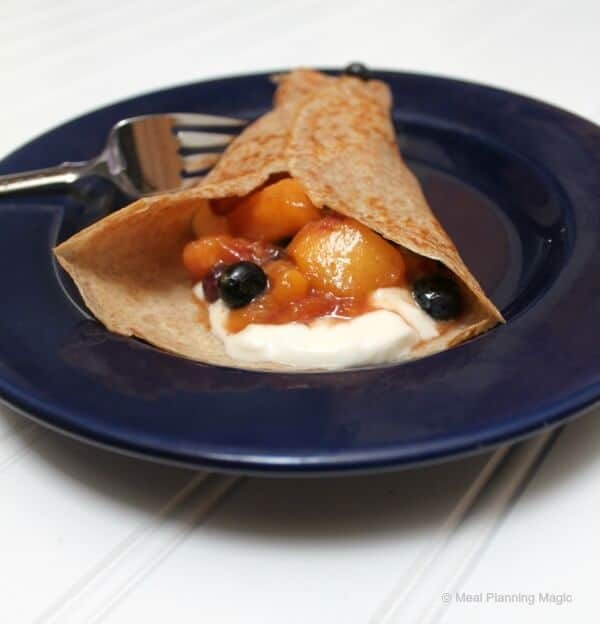 This fruit sauce is delicious in homemade whole wheat crepes with a little yogurt. A healthy breakfast or dessert! This sauce make a delicious fruit topping for vanilla ice cream too. For all the details about the Eating The Alphabet Healthy Recipe Challenge, check out my post from earlier this year (or if you are a blogger and want to join in, there is a sign-up form to complete). Don’t forget to check out the Eating the Alphabet Pinterest board. There you can keep track of all the recipes that are added month-to-month but also find new recipes from last year too. What’s your favorite fruit, vegetable, grain or legume that starts with the letter M, N or O? 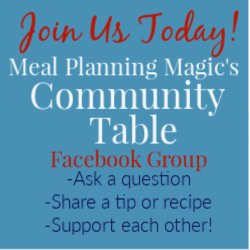 Be sure to check out all the other blogs shown below to discover new recipes and ideas! I would love to try this sauce over my breakfast oatmeal. Yum! Ooh! I will have to try it over oatmeal too–I bet that will be delicious! Can’t wait to see what you come up with this month!